This picture shows the viewer a real deep Russian landscape, where densely and lushly overgrown with needles. The edge of the forest, illuminated by the rays of the warm summer sun, rejoices in this infinite warmth and light. The golden light of the sun touched the crowns, and, slowly leading away the rays, penetrated deep into the darkness of the forest. When you look at the canvas, you want to take a deep breath in order to feel this tart and fragrant aroma of pine forest with all your breasts. A little distracted from the forest, you can see the stream flowing from the trees. The water in it is clear and warm to the bottom. With this all-consuming heat, every grain of sand in a stream, every living soul in the forest is permeated. Everything in the picture is transmitted with maximum precision, so that even there are no bright images or spots, or a place to which the author would like to draw the viewer’s attention. This is not a whim of the artist, it is his reality. He believes that nature should be portrayed in its true colors and colors, because nature does not tolerate lies and falsehoods. Why embellish what was perfect from the start? Without finishing anything, without inventing anything, the author simply conveyed what he saw, so that everyone could add or “finish” the picture in his mind. It feels like the picture is not complete. There is no diversity of vegetation, because in fact it is not in the pine forest. At the same time, the picture attracts its audience with the peculiarities of the national Russian landscape. Its not conquered by power and greatness, its boundless desire for height and spaciousness. The gigantic size of this Russian coniferous forest absorbs everything that is finer or lower. Looking at the picture, one can feel calm calm and silence. 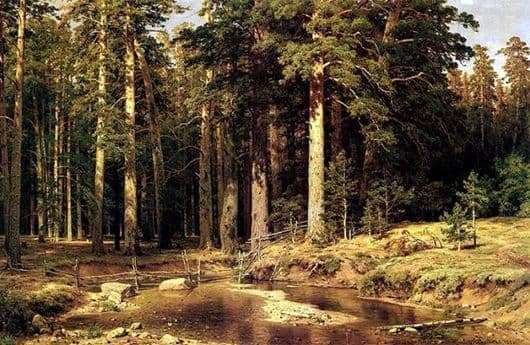 However, it reminds a bit of his previous works – “Pine Forest”, for example. Only in this work he was not distracted by contrasts and detailing, he brought to the viewer’s life the strength and inflexibility of the Russian landscape, by pushing the trunks of the pines to the fore.